What is the best car seat for your child? The best car seat is one that fits your child, fits your car’s seats and seat belt system, and is easy to use. Most importantly, it must meet national safety standards. The car seat must fit your child well. If your child is 1 year old and over and weigh 20 lbs or more, you should buy a rear facing car seat. Rear facing car seats reduce the risk of cervical spine injuries during motor vehicle accidents. If your child is less than 1 years old but already 20 lbs or more, you should still buy a rear facing car seat, however, you need a car seat that is approved for higher weights until they turn 1. Children who are 1 year old and over and weigh 20 lbs or more: buy a rear facing car seat, because these reduce the risk of cervical spine injuries during car accidents. Larger infants, in other words, children less than 1 years old who already weigh 20 lbs or more: buy a rear facing convertible car seat or infant seat, but it must be approved for higher weights. Find out the maximum weight that the car seat can accommodate. As long as you are within this maximum weight and as long as the top of your child’s head is below the top of the seat back, your child should be rear facing for their protection. Premature infants: if your child is less than 1 years old and was born prematurely or is small for their age, you should avoid car seats with shields, abdominal pads, or arm rests that can come in contact with your child’s face or neck during a car accident. Why are rear-facing car seats so important for infants? Rear-facing seats support the head, neck and back of your child in a frontal crash, allowing for the force of the crash to be distributed across the entire head and body. An infant has a larger head in proportion to their body. If your get into a frontal crash with a front-facing car seat, your infant’s head would move forward putting the force on their neck which can lead to a head and cervical spine injury. A rear-facing seat means, your infant’s head moves with the seat protecting their head and neck. The car seat then absorbs the force from the impact, protecting your child. There are two main types: rear-facing car seats and convertible car seats which can be configured as rear-facing. What type of car seat should new parents first buy? A convertible car seat that can later be used as a rear facing seat when the child grows is the recommended choice for most parents. This is because these car seats offer the option of having your child sit rear facing or forward facing. Until your child is 1 years old and at least 20 lbs you should have the car seat in a semi-reclined and rear facing position. Then, once your child grows, the same convertible car seat can be positioned upright and forward facing as long as they still fit. To find out if your child can still use the same car seat you can check the weight maximum and height maximum on the instructions for the car seat. The tops of their ears should be below the top of the car seat back and the shoulders should be below the seat strap slots. However, it is always important to check the sizing in the manual. Later, when your child outgrows the convertible car seat, a forward-facing seat, belt-positioning booster or other combination seat should be used until they are old enough to use your car’s seat belts. A belt-positioning booster can be used until your car’s seat belt fits well. Your child will be ready to use your car’s seat belts when the shoulder seat belt can be put across their chest and the lap belt fitting snugly across their thighs. Your child should be sitting against the car seat back and have their legs bent at the knees and feet hanging down. Tip: if you are in the market for a new car, some of the newer models come with integrated car seats and some of these integrated seats later convert to booster seats! The harness is supposed to hold your child in the car seat so they don’t slide up and out of the car seat during a car accident. Car seats can come with a 3-point harness or a 5-point harness. Convertible rear-facing car seats come with a 5-point harness. Look for a car-seat with an adjustable harness height so you can adjust it as your child grows. Also look for a car-seat that has multiple positions or adjustments for crotch straps so that the fit can be adjusted as your child grows. This is important as the crotch strap keeps the child from moving forward in the car seat during accidents. Your car seats straps should pass the “pinch test” meaning you cannot pinch the harness webbing when the harness is buckled. You can check for this at the hips or shoulders. Shield boosters: these have not been certified by their manufacturers for use by children who weigh more than 40 lbs. You should look for a car seat that has a removable shield. During car accidents, children are often injured as their heads and other body parts come into contact with the shield, therefore, even though shields may meet the safety standards for children weighing 30 to 40 lbs, they are not recommended by the American Academy of Pediatrics. 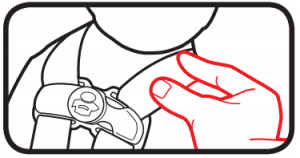 Restraints: if your child is too heavy (>40 lbs) or too tall to fit in a seat with a full harness, look for a restraint that can be used as a belt-positioning booster seat. Restraints that are convertible, and can be used either as lap and shoulder belts or belt-positioning boosters are the best choice. There are various add-on devices that claim to help seat belts fit better, however, their safety has not been evaluated by the NHTSA. It is best to avoid them, and rather look for the best fitting car seat for your child. Never place a rear-facing infant car seat in the front seat when there is an activated passenger-side air bag. This is because, there is the risk of serious injury and even death if the air bag is activated and hits the back of your child’s car seat. The safest place for children is the rear set in the car. In general, your infant should be sitting at a 45 degree angle in their rear-facing car seat. However, check the car seat instructions and follow recline angle instructions for your car seat. Most car seats have a recline angle indicator. If the angle is too low, your child’s head can flop forward, which can lead to airway obstruction. Look for a car seat that allows you to adjust the angle of the seat. If your car seat doesn’t allow you to adjust the seat angle, then you can use a roll of Styrofoam, cloth, newspaper, etc under the seat, below your child’s feet to get the correct angle. Lower Anchors and Tethers for Children. It is a standardized seat attachment system that is found in most newer cars and it is supposed to make installing your car seat easier and safer. In older cars, seat belts can be used to attach the car seat. You should use either seat belts or lower anchor connectors to secure the car seat to your car – check with the car seat instructions for your car seat. Universal Anchorage System. This is the name for the LATCH or lower anchor system in Canada. Removable shield booster – shield boosters are not recommended for children > 40 lbs by the American Academy of Pediatrics due to the potential for injury. NHTSA safety rating – National Highway Traffic Safety Administration rates car seats for safety in the United States. Convertible – convertible car seats allow for longer use, first as a rear-facing car seat for your infant then as a forward-facing car seat as your child grows.